1 Drain the bell peppers and cut into wide strips. 2 Trim tomatoes, rinse, cut in half and cut into slices. 3 Lightly coat 2 small oven-proof dishes with oil. Distribute bell peppers and tomatoes in dishes. Add salt and pepper. 4 Cut the feta cheese into slices or break into pieces and sprinkle on bell peppers and tomatoes. 5 Squeeze lemon. In a small bowl, mix honey, remaining olive oil, lemon juice and fennel seed. Pour over the cheese and season generously with pepper. 6 Sprinkle breadcrumbs over the top. 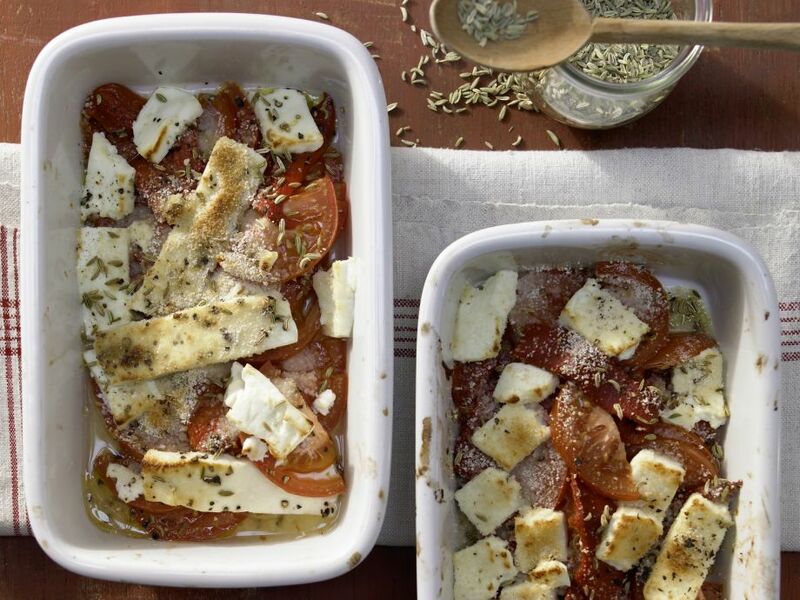 Place the ramekins in the preheated oven and bake feta cheese at 200°C (fan oven 180°C, gas mark 3) (approximately 400°F/convection 350°F) until golden brown, about 10 minutes.